Note: This was originally posted on Wednesday, May 11, 2011. Due to an outage, the original file was lost. The text and images remain the same, but some of the formatting may have changed. Photo courtesy of the Cleveland Landmarks Commission. The Columbia building on Prospect-av. at E. 2d-st. stands alone as the only eight-story reinforced concrete building in Cleveland. It was the first to be built under the provisions of the revised building code. It was erected by M.A. Bradley, who has erected a number of other buildings during the past year. Cleveland Plain Dealer, December 26, 1909, page 25. 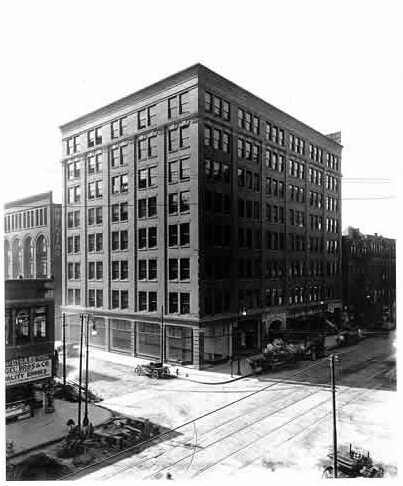 This new fireproof office building, now a Cleveland Landmark, was designed by architect M.E. Wells. It has been the home to many different businesses over the years. The most recent tenant was David N. Myers University, who occupied the space from 1985 until the recent move to Chester Avenue and East 40th Streets. 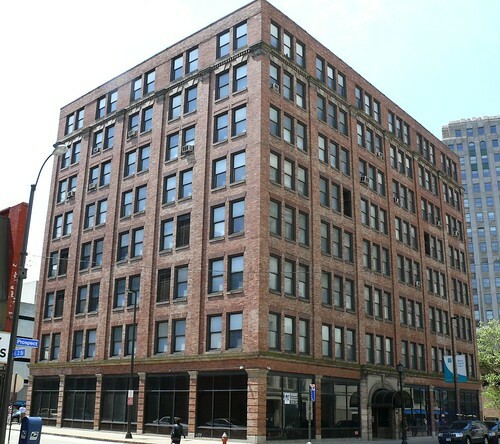 The Columbia Building (112 Prospect Avenue, in downtown Cleveland) is threatened with demolition for a parking garage for the new casino. A report on the matter will be presented at the Cleveland Landmarks Commission meeting tomorrow, Thursday, May 12. This 1909 photograph shows the newly-finished Columbia Building. The first floor featured plate glass windows and retail space yet unfilled. The photo was used in an advertisement, published in the Cleveland Plain Dealer on August 26, 1909, page 8. Another ad, a detail of which is used here, extolls the virtues of the location - on the streetcar line and close to Public Square. It was published in the Cleveland Plain Dealer on October 3, 1909, page 8. The full history of this building is not known. It has been an office building since it was built, but the full tenant history remains to be investigated. It would be interesting to learn everything that might have happened within in these walls. Photograph by Warner Thomas, City of Cleveland Bureau of Photographic Services. This 1981 photograph shows the entrance to the building, now marred by a less than pleasing awning. This could be remedied with relative ease. Courtesy of the Cleveland Landmarks Commission. Some parts of the ornamentation surrounding the entrance can be seen in more detail here. The building, while not as grand as some, is an attractive, solid structure, that contributes to the history of the city and the character of the neighborhood. It remains in good physical condition and could readily be used for any number of things. You might ask, why, then, is it being demolished? The demolition of this Cleveland Landmark will make way for this, the "welcome center" (parking garage) for the new downtown casino. This rendering shows the side facing Ontario. The older building in the center of the image is the Stanley Block, one of the oldest commercial structures in downtown Cleveland, which, thanks to your efforts, was saved. I really try to avoid architectural criticism. It's better left to people who are more knowledgable, like Steven Litt. Further, I attempt to keep my opinions here limited to those surrounding history and historic preservation. With that said, the proposed parking garage seems like almost as much an assault on the historic Stanley Block as condemning it was. I see no attempt to make the new structure harmonize with the existing one. This could have been done through use of similar lines, or through similar materials, or through any number of other means. It seems almost as if they're trying to make the Stanley Block stick out so much from the surroundings that the public will want it gone. Further, no attempt has been made to make it fit with the neighborhood. A design that would appeal to casinogoers could surely also make this concession. How does this relate to the Columbia Building? Because the land the Columbia Building is standing on will be part of the parking garage. I understand that parking is necessary. But it seems stupid to replace a perfectly good building with a parking garage of questionable merit when there's a vacant lot but a block away that's being used for surface parking. The lot in question is bounded by Prospect, East 4th, and Huron. It could be used for a combined parking lot for the Q and the casino. This would free up the lot utilized by the Q Arena on Ontario for use by the casino. 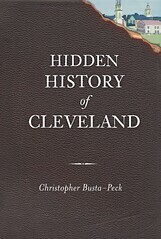 The plans may be found in the agenda for the Cleveland Landmarks Commission meeting tomorrow, May 12, 2011. An archive of the plans can be found here. You may register your opinion either by appearing at the Landmarks Commission meeting tomorrow morning at Cleveland City Hall, at 9:00 am, or contact either Commission chair Jennifer Coleman, Commission secretary Robert Keiser (216-664-2531) or Councilman Joe Cimperman (216-664-2691). From a planning perspective, it is clear that the Gateway/Public Square area remains one of our most intact, walkable districts. Building density and vibrant sidewalks are some of this area's distinctive qualities and selling points. By accommodating another structure dedicated almost entirely to parking and linking it by elevated walkway to the casino floor, we will do nothing to enliven the street, encourage new economic activity on adjacent properties, or otherwise enhance the immediate area. We will have deadened another corner of our downtown and will have exacerbated the drive-in, park, drive-out nature of too much of our city's core. The massive driveways and vehicular circulation pattern being proposed by the garage's developer are a stark contrast to the investment the City is currently making on the other end of the block in the soon-to-open "Bike Rack," Cleveland's first bicycle station, and to the $6 million ODOT has pledged to bicycle and pedestrian improvements on the nearby Lorain-Carnegie Bridge. The plans run counter to the recently completed TLCI (Transportation for Livable Communities Initiative) planning effort for the Gateway/Playhouse Square area that focused on pedestrian and bicycle networks, building off of the success of East 4th Street, Euclid Avenue, E. 14th Street, and the rapidly urbanizing CSU campus district. They do not comply with the ideology of the Public Square Task Force, a group of citizens, business leaders, and other stakeholders who have convened over the past several years to envision a more welcoming, user friendly public commons for our citizens and visitors. Real estate prices in both small towns are booming...if these buildings are torn down, and "leadership" continues in this direction, we are all going to be looking at Detroit model of "development." In regard to the proposed downtown Casino Welcome Center project, I have several strong concerns about some elements of the proposed facility. • If one of the stated goals of building the casino is to revitalize our downtown, then we should not be allowing the historic building fabric of the city to be demolished. 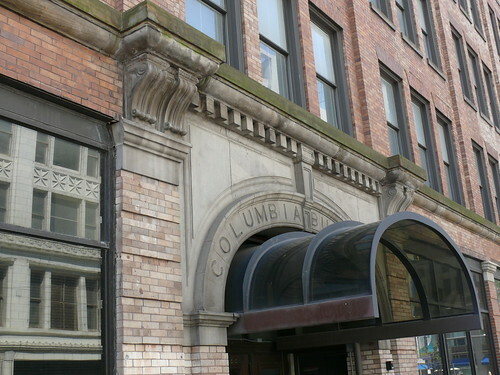 The historic Columbia Building has great potential to be redeveloped into loft apartments or some other use. If we continue on a path of incremental destruction of our architectural heritage, we will one day wake up and find that there is nothing left to protect, and that the price that we paid for this economic development was too great. • We already have PLENTY of parking downtown, and more than enough empty lots. Surely, Rock Ohio Caesars can find somewhere else to build the Welcome Center/Valet Dropoff Center, within a reasonable distance from the new casino, that does not require the demolition of a designated historic landmark. Why not start with the property on the south side of Huron on which they will be building Phase II of the casino? If that is not feasible at this time, then we need to encourage Rock Ohio Caesars to go back to the drawing board and think more creatively about the issue. We must not bow down to every whim of the developers, just because we are hungry for the dollars that they bring. Downtown development should be encouraged, but not at the cost of sacrificing the history and character which make Cleveland unique. • The proposed bridge across Ontario Street, linking the Welcome Center to the casino, requires serious study. The bridge’s location, spanning the intersection of Ontario and Prospect, would have a severe negative impact on the approach experience to Public Square, impeding the view of the Old Stone Church, the historic Society Bank Building, and the axial relationship to the Cuyahoga County Courthouse up Ontario. A public discussion needs to occur about whether this bridge should be allowed at all. The bridge, if it were allowed, would become a new gateway to the center of the city. Thus the design and materials of the bridge would have to be top rate. And because this intersection is a public right of way, the citizens of Cleveland are entitled to have a strong voice in the aesthetic treatment of such a structure. It would be far preferable to eliminate the need for the bridge by building the Welcome Center elsewhere, such as on the Phase II casino site, bringing patrons into the casino through the grand main atrium of Tower City Center. • The entrance to the valet parking is overly wide, and will be very difficult for pedestrians to cross. This entry is overscaled for its urban environment. It should be narrower, shorter, and preferably off of a side street, not off of one of the major arteries of the city. The opening is as wide as the entire Stanley Block building. Again, if the stated goal of the casino is to bring people back to the center city, we should not allow them to be alienated by wide driveways and sidewalks that are hazardous to maneuver. The mission of the Planning Commission is to protect the integrity of the city for the welfare of future generations. The Commission should offer leadership and guidance to developers as to the vision of the city we want to see. The Commission must do everything in its power to protect our invaluable architectural legacy for the benefit of all. 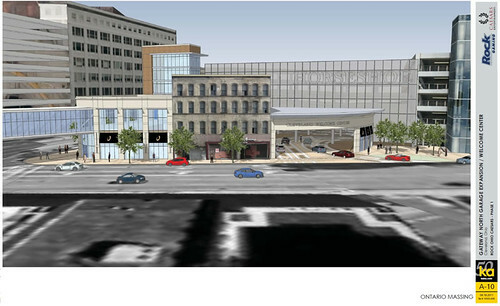 These "plans" from the casino developer's "architects" are hideous. Gerbil tubes were, I thought, discussed and tossed aside during the painfully nauseating medcon debacle discussion. I had to look... at the website and portfolio of these so called architects - the "professionals" who attempt to foist this hideous thing on Cleveland. Aha! The very same Lego-playing little boys who made the equally hideous, but actually built University Square shopping debacle in University Heights. You recall, the one with the collapsing parking garage. Oh, Cleveland! In your desperation, do not grasp the hand of the incompetent, do not reach for the tacky, do not erase your history or exchange it for the plastic bauble perchance grasped inside the dollar-a-chance glass box, "The Claw" arcade game. Do not reduce city planning to a game of chance squandered and lost while you attempted the precarious balance of alcohol and amphetamines. I find this entire discussion a sad reflection of Cleveland's current stance; on bended knee before the casino, groveling for a fix, addicted to the fleeting drug induced release from reality. Has Cleveland not suffered at the hands of wealthy gamblers, bankers, speculators and developers enough yet? Oh Cleveland! Get thee to rehab post haste. I wonder whether the "M.A. 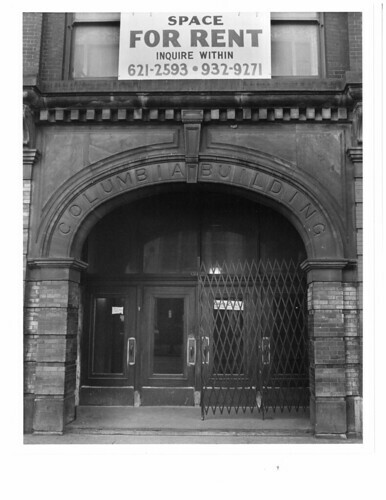 Bradley" who built the Columbia Building is Morris A. Bradley, who was the son of Cleveland's famed Capt. Alva Bradley, and father of one of the Van Sweringen brothers' closest associates, Charles Bradley. You don't want to know some of the unethical and shady doings that went on in these walls during the mid-late 80's. The commission to meet for the then new baseball stadium was held in a conference room next to where I worked as a young IT guy. Acoustics were so bad, I knew of every long delay issue and shady dealing; not to mention the worst unethical exec management of the college that resided there. The one positive thing that came about was that experience kept me on the ethical side throughout my career but realizing what higher education was actually about sticks to me to this day. 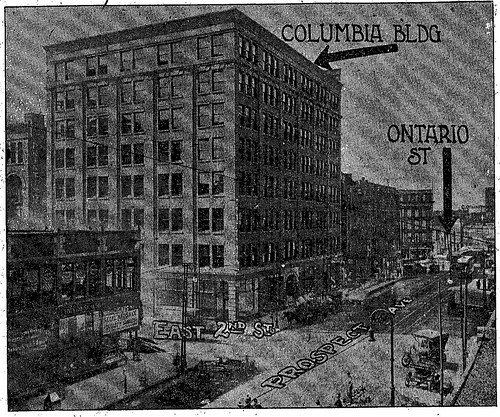 The Columbia Building was the home of the Erie Railroad accounting offices from about 1931 to 1976. Many wonderful memories of working there. In 1960,there was a merger to be called the Erie Lackawanna Railroad. This wretched casino will do nothing positive for the City. First the God dam sky bridge and now more parking garages...teye are all about getting the casino customer out of his car and onto casino property without venturing elsewhere. The concept is for the customers to spend any and all dollars on profitable casino products and services. This casino gambit has long bad history of doing damage to cities. So called city leaders are either naive, bought and sold by the casino corp or incompetent. Assuming corruption isn't the motivation (?) I think they want to be PRO BUSINESS, supportive of business..show that they can accommodate and make things happen for any business that wants to locate in the City. That seems right but judgment about what is really positive for the city is still needed. That is what pays off in the long run. A city run by pushovers and patsies is not going to gain the respect of the business community. Stupid and sad...it's always 2 steps forward and 3 steps back. That isn't success. Watch this demolition get rammed through! I would so like to be wrong about that.